Toronto, Feb. 27, 2018: Music Canada today announced it is curating music through its new profile on Apple Music. The popular Gold/Platinum certification and awards program joins a growing roster of curators on the service, which includes a variety of media publications, lifestyle brands, festivals, and record labels, including Music Canada member organizations Universal Music Canada, Warner Music Canada, Sony Music Canada, 604 Records, Last Gang, and Cadence Music. 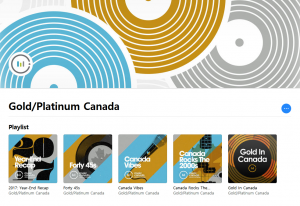 Music fans can follow the Gold/Platinum Canada curator channel through the Playlists section of Apple Music. Five unique playlists are available upon launch, including Gold In Canada which is updated every Thursday with 50 of the latest singles that have the coveted Gold certification, as well as 2017: Year-End Recap, which features more than 300 songs newly certified in 2017. Forty 45s – a collection of past Canadian hits, originally certified by Music Canada as Physical Vinyl or CD Singles. Music Canada first began accepting on-demand streaming data towards Gold/Platinum certifications with the launch of the Single Award in 2016. In the summer of 2017, Music Canada updated the guidelines for the historic Album Award to begin including Stream Equivalent Albums (SEA) and Track Equivalent Albums (TEA). Check out Music Canada’s Gold/Platinum playlists on Apple Music here. Follow Gold/Platinum Canada on Twitter, Facebook, and Instagram to stay up-to-date with the latest certification announcements, award plaque presentations and playlist additions.